OTTAWA — “Mr. Speaker, the facts speak for themselves. This is the Conservative position on parents and grandparents. The Conservatives described parents and grandparents as a “burden” on the federal government in terms of financial support. They have described parents and grandparents as a drain on the provinces. That is their position. They can run, but they cannot hide from that position. We are responsible for quadrupling the number of spaces that parents and grandparents have to come to Canada. We will continue to reunite more families. I am amused by the Conservatives’ new-found passion for reuniting families. However, when they had the chance they failed.” — Immigration Minister Ahmed Hussen during question period last week in the House of Commons. 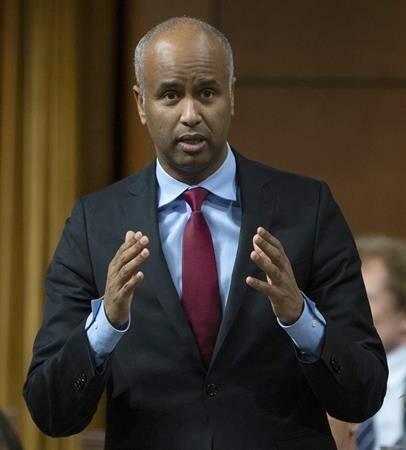 Hussen’s remark raises a question — have the Liberals succeeded in reuniting more families under the parents and grandparents program than their Tory predecessors? Hussen’s remark earns a rating of “a lot of baloney” — the statement is mostly inaccurate but contains elements of truth. Here’s why. Between 2011 and 2015, the then-Conservative government admitted an average of 20,370 permanent residents per year under the parents and grandparents program, according to the Immigration Department’s annual reports. He insists the parents-and-grandparents program is only part of the Liberals’ work towards family reunification. “When talking about family reunification, as the minister does in the second portion of the quote, it is important to not limit yourself to the parents and grandparents program,” Genest wrote in an email. In 2016 and 2017, the annual reports show an average of 61,117 people per year were accepted under this category. During the Conservatives’ time in office, the annual average of new permanent residents in the spousal program was 46,027. Immigration experts say there’s been little difference between the Liberal and Conservative approaches when it comes to the parents-and-grandparents program. “It just sort of shows how, in fact, Liberals and Conservatives are kind of working on lockstep in this particular issue, despite the fact that the Liberals might want to identify their immigration policies as more humane,” said Sharry Aiken, an immigration law expert at Queen’s University. She noted that both the Liberals and Tories have steadily eroded the importance of family reunification within Canada’s overall immigration program. Aiken said about 40 per cent of the overall immigration intake came from the family class in the early 1990s. Since 2000, they’ve been making up just over 20 per cent because the government has put more emphasis on economic-class immigrants, she said. The Immigration Department’s latest publicly available numbers show that fewer permanent residents have been accepted under the parents and grandparents program under the Liberal government, compared to its Conservative predecessors. MONTREAL — Many people in Quebec and New Brunswick will be spending their Sunday filling sandbags as they keep an anxious watch on rising floodwaters that are wreaking havoc across a wide region. About 200 soldiers started filling sandbags and carrying out evacuations in Quebec’s Outaouais and Mauricie regions overnight, with an additional 400 troops standing ready to deploy there and in Laval today. Urgence Quebec says that as of last night, bloated rivers had resulted in 903 flooded residences, 251 isolated residences and 317 evacuees across the province. Eight major floods have been identified as threatening thousands of Quebecers, and so far one death has been blamed on the high water. Some of the worst flooding has been in the Beauce region south of Quebec City, where 868 homes were swamped and 94 people evacuated.